Chudan uke: to "spiral" or not to "spiral"? "Ok, so I've thought about something else that I don't completely understand about chudan uke. I've been taught that as the hand goes under the opposite elbow, the fist should face palm up. Why? Wouldn't it be more of a spiraling motion if the fist started with the palm down and then turned up as it intercepted the attack?" The question is a very interesting one and not many pick up this point. Let's start with the goju chudan uke. As my colleague mentions, the block is done with a fist that stays "palm up" through the entire movement. This type of movement relies on the circular action of the entire arm (moving at a 45 degree plane to your chest) to deflect the attack. Another way of deflecting an attack would be to use a spiralling movement in your forearm. 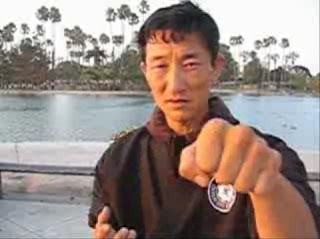 This can be done from palm down to palm up or vice versa (both are found in the martial arts). Let us consider the former. In my view this is the correct way of performing what I call the "shorin chudan uke". If I understand the initial question it can be paraphrased as "why not do both the arm and spiral deflection together"? 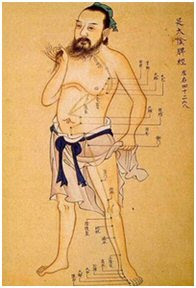 Others have gone further and placed the "spiral" into kata such as gekisai dai ichi. I strongly object to this. Why? Blocking actions that involve both circular arm deflection and a spiral forearm deflection are compound movements: in other words, you are combining 2 different techniques. While this can be useful at times, it does not mean that it should be the default. This is particularly so when you are doing gekisai - a relatively basic form in which you should be learning the fundamentals. To learn fundamentals you need to isolate them. You won't ever really understand the correct way to use the circular arm deflection if you also use a spiral and vice versa. You will simply end up confusing the two. Nor is a compound movement always warranted; I've found that in about 70% of my sparring I utilise either a circular arm deflection or a spiralling forearm. Only in about 30% of cases do I perform some sort of hybrid/compound movement. "Why then isn't the hand turned the same direction with open-handed blocks?" What my colleague seems to describe here is the reverse: in other words: Why doesn't the hiki/kake uke (open hand block) start palm up so as to finish palm down? Lately I've seen a lot of Youtube footage of people putting this kind of spiral into the hiki/kake uke of kata such as gekisai dai ni and shisochin. Once again, I'm firmly against this. The open hand deflection (hiki or kake uke in goju ryu) is a fine technique in itself. It does not require augmentation with a spiral - and certainly not in every case. 1. 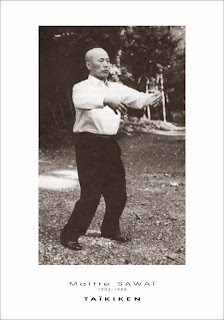 I note that in offshoots from the Goju Kai organisation, such as Zen Do Kai, the "spiralling hiki uke" is sometimes replaced by a "palm up" block (ie. as if the spiral started, but never finished). I see this as symptomatic of the introduction of the spiral where none was warranted, resulting in a dilution of both the original hiki uke (open hand, palm down block) and the spiral deflection as used in the Goju Kai version. I wish I had a dollar for every time I've been asked about those ropes! I'd be a rich man indeed. Those ropes are indeed used for strength and flexibility training. They are specifically designed for use in Iyengar yoga (the centre is used for both martial arts and yoga practice). We use the ropes for a variety of pulling exercises and as stretching aids. I'm not an expert in Okinawan Karate by any stretch but there's something amiss with the video in the footnotes! 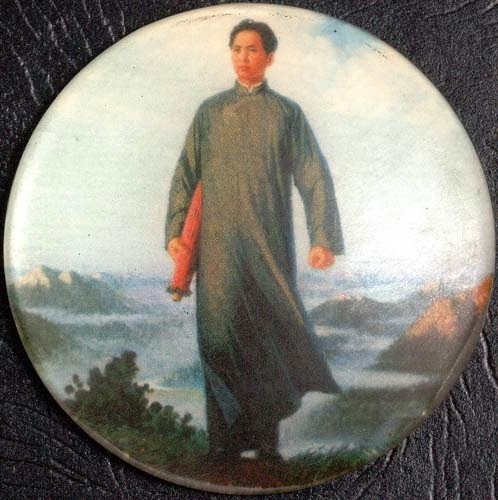 I can't quite place my finger on it...he doesn't seem set in his stance, his posture seems to give, his movements seem altogether awkward like he hasn't been studying martial for very long. 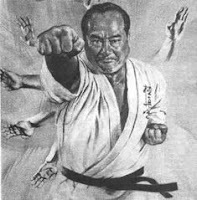 On another note: I've been researching some of the branches Shorin-ryu, and I was wondering what you knew about matsubayashi ryu. 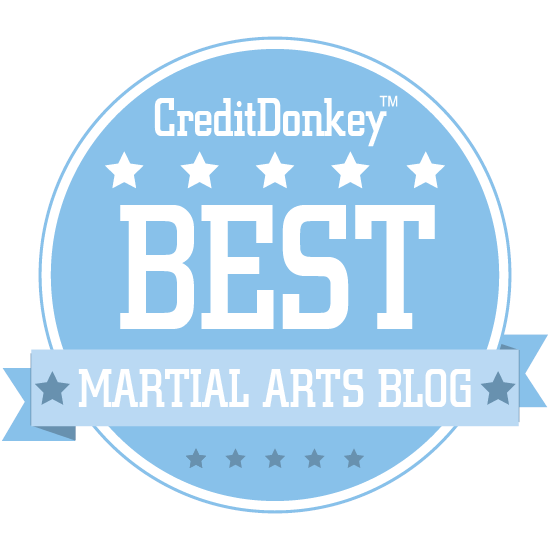 If you could write an article about some aspect of matsubayashi ryu that would be awesome! Thanks Joshua - I'll see what I can do. Yes Bill - James tells me there's a third! I believe the issue is not whether palm goes up or down, but what makes sense in terms of task we are supposed to accomplish with that technique. 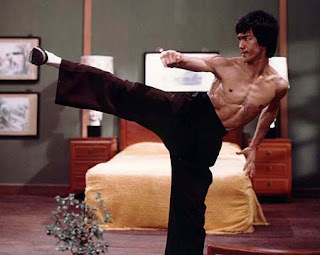 After all, martial arts are nothnig but rational thinking applied in combat situations. 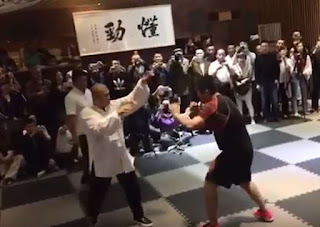 My understanding of chudan uke is that it's not a deflection or a block against a punch, but rather a movement that is performed when the opponent grabs your wrist. Basically it's the same movement that appears in akido's kote gaeshi, i.e. the wrist lock. You move your hand a bit down (palm-down) and to the left and then you make a circular movement to the right while raising your hand up with spinning it to palm-up position. With additional body movements this causes instability in the opponent's posture, which gives you an opportunity to deliver a blow or simply take the opponent down. When I had doubts about similar issues, my sensei used to tell me to put the technique to the test and see what works. If none of it works and you cannot figure out why, he would say, than you're simply not mature enough to know it, so why bother. Thanks for your input Edward, however I have no doubt that chudan uke is a deflection against a punch; I use it too often (almost every training) for this purpose and have done so for the last 30 years. I think the reason many people don't know about the chudan uke as a deflection is that they are missing some vital bits of information that are necessary for it to work. 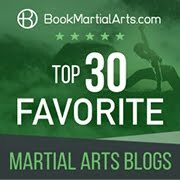 In this regard I invite you to read my article: "Dilution of martial techniques: chudan uke". I don't pull any punches in that article and I won't do so here: most karateka I see on the net aren't doing the chudan uke correctly - it's as simple as that. It works, and it works fabulously, as per the gif below. Chudan uke (like it's relative, hiki uke) is so simple, is applicable in sparring and in fact opens so many possibilities - one of which is that you realise that you can actually use karate in free-fighting - that it is in many ways the "key" to everything. Yet I often hear people cite chudan uke as a strike, a lock, a hold etc. The "blocks are strikes are this, are that..." mantra is to me manifestly wrong - and I've made it one of my key objectives to educate people about the power of this technique and how it can unlock karate's true potential. We do a lot of drills using chudan (we call it uchi uke) and hiki uke trying to block every punch coming non-stop. It gets cool when you start doing it right and stop getting hit :D (I've tried this same exercise with Ura Uke as well, and it works just fine). Yes - uchi uke is another way of describing the deflection and this is because uchi (内) means "inside", indicating that you are using the inside edge of your forearm (that is, the edge that is on the inside when your arms are resting at your sides). Unfortunately many people (perhaps the fellow with the awful chudan uke) think it means uchi (打) or "strike" (ie. the "block" is a "hard" or "striking" block. I think the whole "hard" block stuff is largely nonsense invented as a rationale for a chudan uke that has, through dilution, lost all function as a deflection. There is some scope for "hard" or "striking" blocks - but that scope is in my view limited to less than 5% of your martial arsenal if that. In other words, there is little point in thinking of traditional blocks as "predominantly strikes". There are much better weapons for striking and a host of problems with using movements like chudan uke offensively (not the least of which is that your contact, in a hard striking action, becomes the little bones of your forearm which are quite weak). As for the "striking" blocks, my teachers used to say that "bad karatekas" (they usually mentioned Shotokan schools, perhaps because what has got here as Shotokan is another example of thi "dilluted" karate) did thei blocks that way, and that Karate is an "art", not brute power: it is all about being clever and smart, not about being the biggest badass in town. Yes - chudan uke attacks sound silly don't they. And yet there is a whole industry out there that talks about "hard blocks". The fact is, some people can and do use a chudan uke as a very hard striking action - hard enough to break a limb. But as far as I'm concerned, developing this kind of ability has such diminishing returns that it is worthless. And it misses entirely the elegant magic of the chudan uke that subtly redirects an attack and sets you up for an ideal counter. In this case, softness rules! I’m sorry but I wish I could see a fabulous work of chudan uke in a more realistic scenario than in this not-so-impressive prearranged exercise. Showing a fast and clear deflection against such a pitiful attack that you know how and when it’s coming, and against an uncommitted opponent is no proof of that technique’s effectiveness. I’ve seen real full-power punch attacks and I’ve never seen any of them ever being either blocked or deflected in such a fashion. The fact is that you never get that opportunity when fighting an aggressive and vicious attacker whose moves are always fast and erratic. 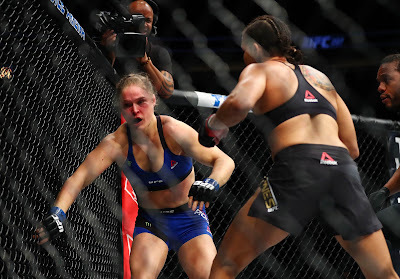 Diluted techniques in general come from nothing else but from a diluted perception of the reality of fight (and the real fight is what traditional karate was all about). Keeping in mind karate’s history and its evolution from ancient times, I always question if some technique is there because someone really used it, or it’s a diluted version of something else, or, perhaps, it’s only a remnant of an intellectual exercise that has never been really tested. Judging from my experience, if chudan uke is really meant to be a deflection, as you’ve described it here, then it’s nothing else but a wishful thinking and you’d better use something else to defend yourself. Otherwise, its true meaning is yet to be explained. And yet I use chudan uke in hard and fast sparring all the time... Perhaps not in its full basic form, but certainly in a slightly looser, more abbreviated fashion (on the other hand, that is true of all karate basics). But I have yet to use it for other purpose.